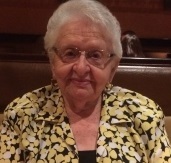 Irene Mary Berki, age 92 of Kissimmee, FL passed away on November 21, 2018. She was born 1926 to Joseph and Mary Frank in Chicago IL. She was married to Gabriel Berki Sr for 60 years before his passing in 2007. She was a beloved Wife, Mother, Grandmother and Great Grandmother. She is survived by her children Gabriel Berki Jr. Son and his wife Teresa, Arlene Ferek Daughter and husband David, Richard Berki, Son and wife Cindy, Robert Berki Son, Ann Marie Berki Daughter and 11 Grandchildren and 6 Great Grandchildren. She is pre-deceased by her brothers Rudolph Frank and Joseph Frank. Visitation will be 11:00 A.M. to 12:30 P.M. Wednesday, November 28, 2018 at the Roger C. Thompson Memorial Chapel, Conrad & Thompson Funeral Home. A Mass of Christian Burial will be celebrated on Wednesday, November 28, 2018 at 1pm at Holy Redeemer Catholic Church in Kissimmee, FL . Interment will occur in Resurrection North Cemetery in Kansas City, MO at 11AM, Saturday, December 1, 2018.